Please join me at the opening of my photography exhibition Thursday November 9, 2017 at Shoh Gallery in Berkeley, California from 6-9 PM. I look forward to celebrating my vernissage with you! While I was away practicing night photography in the eastern Sierra, my new Nikon D850 arrived. Today I got to open the box, configure the menus, figure out where a couple of controls that had (inexplicably) moved from their placement on my D810 had landed, and generally get to know my new go-to photographic capture device. The path to knowledge is practice; hence, the two versions of a photo of a very small flower I made in my garden today with my D850. I also plan to use my new beast to photograph on my light box tomorrow. I haven’t grokked everything about this beast yet, but it is pretty clearly a powerful and well-designed tool. I like the added resolution in the RAW files. Compared to the D810, the sensor has gone from 36.3-megapixels to a whopping 45.7-megapixels, a gain of about 25% over an already high-resolution professional camera. I also like the new LCD screen, which is a bit larger, folds out into different positions, and is touch sensitive (yeah, I know, what took so long?). In preliminary conclusion, if I weren’t a professional with the need to deliver very large prints to collectors and customers, would I have spent the considerable money to upgrade from the D810 to D850? Hard to say, but easy to say that this is a remarkable tool for pursuing the craft of photography. Note: I have no professional relationship with Nikon, other than that Nikon has occasionally licensed my images for use in various publications and on the Nikon USA website. I paid for this camera with my own cash money. Please consider joining me and other Photography Masters at the PhotoPills Camp in May, 2018 on the beautiful island of Menorca. For more information, click here and register to get priority. If the link opens in Spanish (and you prefer English) click the Eng button on the upper right. And you’ll be experiencing the island the way we do, the way the islanders do. You’ll feel like a local, not like a tourist. Simply mix Menorca’s gems with some of the best easy going photography masters, a jam-packed into the field and straight to the point class schedule (on creativity, planning, shooting, post-processing, social networks & business), multiple photo escapes to our secret locations, the delicious Menorcan cuisine, amazing beaches, hikes, horse riding and boat trips, night picnics, coffee talks, party moments and catching up with old and new friends, and finally add the distinctive PhotoPills fun flavour… and you get the perfect cocktail. It’s time to officially announce the 2018 PhotoPills Camp! → Link in Bio! www.photopills.com/camp . This is your opportunity to join us, the creators of PhotoPills app, along with @shainblumphotography, @elialocardi, @naomilocardi, @joshuacrippsphotography, @ericparephoto, @kimhenry.dance, @inorman, @stylishtravelgirl, Mark Gee (@theartofnight), Harold Davis, Johan Lolos (@Lebackpacker), @albertdrosphotography, José Benito Ruiz, @mario_rubio and @francescogola in a 7-DAY EPIC PHOTO IMMERSION in the island of Menorca (Spain), a nature sanctuary! Who is in? –>Link in Bio! From the heights of the White Mountains, the ranges to the south looked blue in the haze. With very little intermediation from me, photographic capture turned these vast spaces into a layered landscape of a near abstract quality. 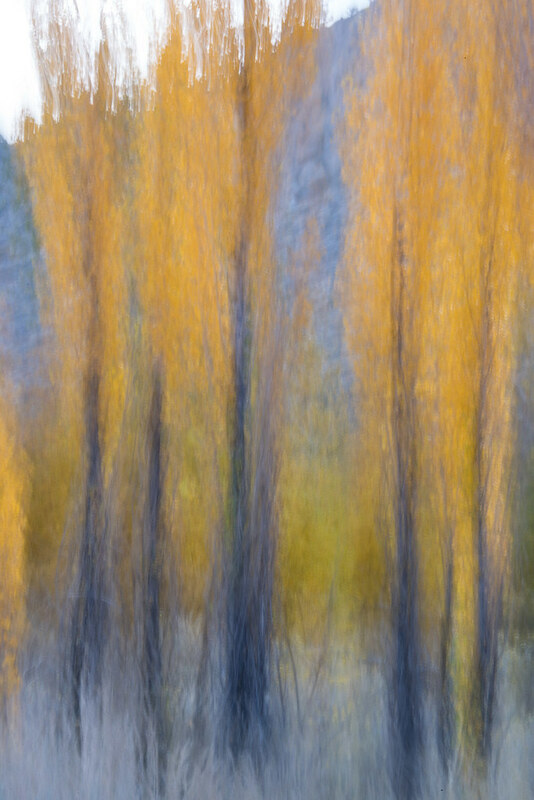 In the early morning light I photographed poplars in the golden hues of autumn. Then I experimented with longer exposures and motion. This impressionistic result was a 3 second exposure with the camera on a tripod; I moved the camera up and down for the last half of the exposure. I had hoped to leave the haze and smoke of the Bay area behind, but coming across Yosemite and then down the eastern slope of the High Sierra we descended into a miasma. 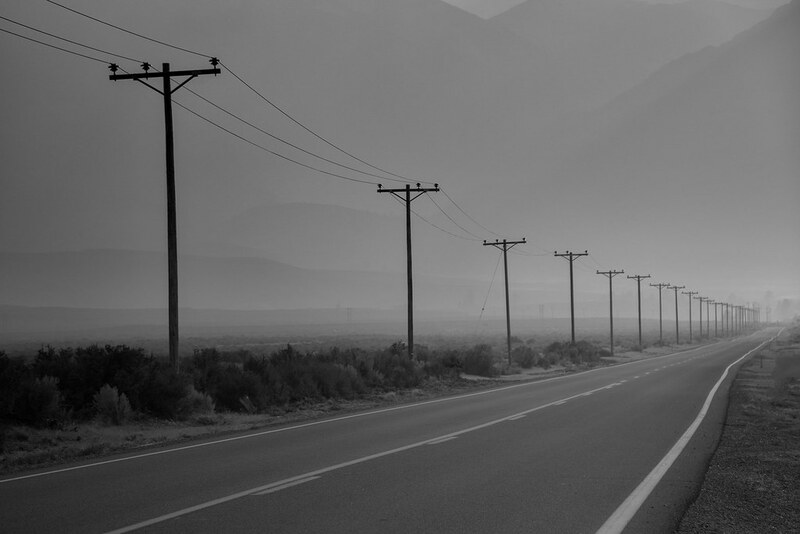 As the light and visibility faded, I stopped beside a lonely road to photograph the line of telephone poles fading into the scarcely visible mountains in the distance. Please consider joining me on a grand photographic adventure to southwest France in spring 2018: Exploring Cathar Country and the Pyrenees-Orientales (April 28-May 7, 2018). A substantial early-bird discount ($500 per person) applies for reservations accepted by Nov 15, 2017. Click here for more information about Cathars and Cathar country, here for a detailed day-by-day itinerary (PDF), and here for the Reservation Form. Due to a cancellation, we have an opening in our upcoming night photography workshop in the Eastern Sierras Oct 20-23, 2017. Click here for more info and registration. It’s not to late to join a group of compatible night photographers in Lone Pine next weekend to enjoy the stars and night skies! A $50 discount is available. I worked with model Jin N Tonic to create a number of images in my Multiple Exposures series. In Chorus of One, I think Jin did a great job of positioning and placement (as well as having enthusiasm, and looking a bit like Marilyn). Jin’s ability to precisely place her body helped to create a sense of pattern across the eight times the strobes fired (each one being an exposure that was combined in-camera using its multiple exposure capability). My Multiple Exposure images use choreographed, in-camera multiple exposures to create an almost stop-motion effect. I like what one can do with this approach, because it combines a technique as old as photography (in-camera multiple exposures) with the full power of modern digital technology. Why, I remember when…to make a multiple exposure on my old Nikon FM-2 you had to press a little button next to the wind lever, to fool the camera into thinking you had actually advanced the film to a new frame. Very mechanical, and yes it was possible to foul it up. Today, it is just a menu item. Boys and girls, if you try this at home, remember to leave Autogain set to On; this is what balances the separate exposures together instead of letting brighter exposures prevail. Click here for Part 1 of the podcast, Black & White Photography in the Digital Age.